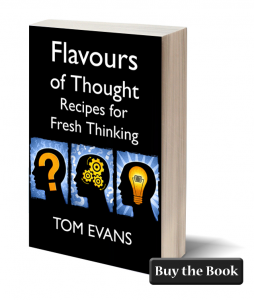 With my book Flavours of Thought, I have surpassed even my own expectations [and advice] and it has lead me into a new area I simply hadn’t planned. For starters, I didn’t plan to write this particular book last year – it just kind of happened. It was inspired by an eponymous chapter in my book on light bulb moments. In addition, I had for a while being studying the Major Arcana of the Tarot and wanted to write a lay person’s guide to it. The two themes came together perfectly and the book ended up ‘writing itself’ during a single month last August. I opened my email after finishing the very last recipe in the book only to find a message from a new publishing service called CompletelyNovel. Within a couple of short weeks, I ended up with the book in print and available worldwide for download from the Amazon Kindle Store. … AND a 1-2-1 karmic mentoring programme that takes people on a tour of the flavours called the Cube of Karma.